In my interior design work I think a lot about creating personalized spaces. For someone in a hurry to “just get furniture in the room” it’s fairly easy to purchase conventionally nice-looking and comfortable decor from a catalog page or furniture showroom floor. However, what I do for my clients - even those I coach so they can create their space on their own schedule and budget - is to find ways to add unique items that bring character and personality to the room. Using vintage pieces, inherited or sourced from vintage and antique dealers, is one way to transform a generic space into a personal reflection of you. In a living room or other lounge area a vintage armchair provides bang for the buck. A single piece can make a big statement without overwhelming the room. Find a good upholsterer or refinisher. If you are not working with a design professional, ask local vintage dealers for their recommendations. Ask the tradesperson lots of questions, be clear and specific, and document everything. Connect with or complement the rest of the room. For example, it’s ok to add a curvy, rococo-like piece to a modern linear room if you use a fabric and/or finish that coordinates with the rest of the room. Play with height and shape while being mindful of seat height. You can add a high-backed wing chair or other statement pieces if you maintain a similar seat height for all other seating in the room. In addition to being visually appealing, this keeps the social dynamic on an even keel, ensuring everyone feels comfortable and relaxed. Check dimensions carefully. All armchairs are not equal. There is a significant variation in sizes and some pieces take up more circulation or “people space” than others. 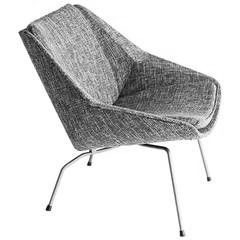 Rockers need to rock and other chairs encourage lots of slouching and stretched out legs. Keep on the lookout and keep an open mind. The best pieces may be found in a relative’s home, at a garage sale, with a vintage dealer, or even misplaced in your infrequently visited guest room. Look at the size and shape – most other elements (color, texture, trim) can be changed and updated to create a wholly transformed piece. Images found via 1st Dibs and shown in B&W (look beyond the existing finish and fabric). See my Pinterest for more details. Have fun creating your personal space - let me know if I can help!